Finding the perfect Las Vegas wedding deals can be a daunting task! It's not just the location and the look and feel of the chapel, but the service provided is just as important. In an age where everything's fast, and quality is sometimes a disappointment; it's a real pleasure to provide you with the exception. Along with our exemplary service, we've prepared several traditional Las Vegas wedding packages to suit your needs. Services include Professional Photography, Video Services, Floral Arrangements, Web Broadcast Services, Elvis Impersonators, Complimentary round trip limousine service from your hotel to the chapel, and several souvenir memorabilia to help commemorate your special occasion. 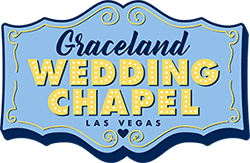 If you have any additional questions about our trademark Las Vegas wedding packages or our reservation process, please don't hesitate to contact the chapel. We are open from 9:00 AM to 11:00 PM, seven days a week.